Nowhere do I see where this plant is DEADLY to dogs/cats eating the leaves. 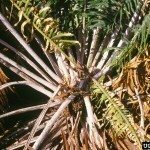 A friend in CA has her 2 dogs in the emergency vet...praying that they survive the day after they both ate a sago palm leaf. Kidney/liver shut-down. THIS needs to be posted on every one of these plants at every store/nursery. I am going to burn all of mine. I am sorry to hear about your friend's dogs and pray they get well. I took a peak and noticed that we DO, in fact, list this plant as being toxic to cats, though it is not listed on the article about dog toxicity - until now. We will have our editors fix this ASAP! Thank you for your comment.